RACING NEWS & REGATTAS Racing News, Instruction, Southern Sailors, and National and International Regattas in the South other major regattas. 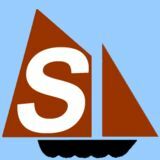 Cost to list a regatta with a description in this section is $35/month ($25 for second month) for the first 130 words (text and title) and $45/month ($35 for second month) for 200 words total. No listing over 200 words allowed. 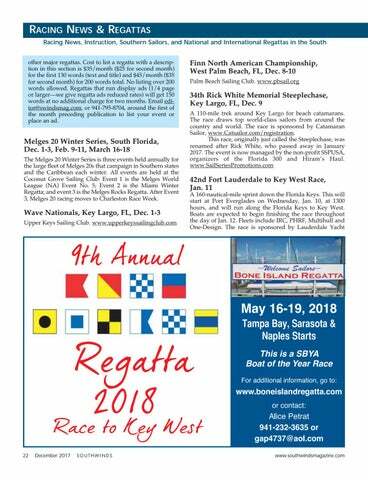 Regattas that run display ads (1/4 page or largerâ&#x20AC;&#x201D;we give regatta ads reduced rates) will get 150 words at no additional charge for two months. Email editor@swindsmag.com, or 941-795-8704, around the first of the month preceding publication to list your event or place an ad. Melges 20 Winter Series, South Florida, Dec. 1-3, Feb. 9-11, March 16-18 The Melges 20 Winter Series is three events held annually for the large fleet of Melges 20s that campaign in Southern states and the Caribbean each winter. All events are held at the Coconut Grove Sailing Club: Event 1 is the Melges World League (NA) Event No. 5; Event 2 is the Miami Winter Regatta; and event 3 is the Melges Rocks Regatta. After Event 3, Melges 20 racing moves to Charleston Race Week.